Kalaheo Pali Kai condos are on two levels. #12 has ocean views from both levels. On the upper level is the kitchen, living and dining areas, all with ocean views. 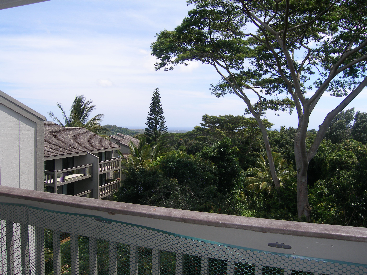 Relax out on the upper lanai accessed from both the living and dining areas. A bedroom and bath opening to a private fenced patio area also on the upper level. The lower level has two bedrooms, both with ocean views and direct access to a lanai, a bath, a laundry area complete with a laundry sink, and a bonus or storage room of approximately 135 sq feet that is currently used as a fitness/workout room. Furniture and furnishings are included. Carpet in living room, wood floors in dining, kitchen and upstairs bedroom, tile in downstairs areas. Custom etched mirrors in every room. Inlaid tile designs on floors of downstairs bedroom and hallway. Two assigned parking spaces. Pets allowed. Amenities include a tennis court with basketball net and a pool. Close to Kukuiolono Golf Course.